Lymphocytes are a type of white blood cell (or leukocyte). They help an organism to fight infections. They occur in the immune system of all vertebrates. All lymphoctes have a large, blob-like nucleus. Natural killer (NK) cells are a part of the immune system a person is born with. They protect the organism from tumours and from cells infected by viruses. Natural killer cells are made active by chemicals released by damaged cells called interferons. Natural killer cells can tell the difference between infected cells, tumours, and normal cells. They recognise changes in the level of a surface molecule called MHC (major histocompatibility complex) class I. The NK cells then release cytotoxic (cell-killing) granules which then destroy the altered cells. 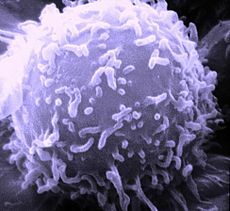 T cells (thymus cells) and B cells (bone cells) are the main cells of the adaptive immune response. They tackle infections, and they cause the immune system to 'remember' the event. The function of T cells and B cells is to recognize foreign antigens. Antigens are surface molecules on a cell. Once they have identified an invader, the cells respond to remove pathogens or pathogen-infected cells. B cells respond to pathogens by producing large numbers of antibodies which then destroy foreign objects like bacteria and viruses. Some T cells, called T helper cells, produce cytokines that direct the immune response. Cytokines signal to other immune cells that there is a foreign antigen present. Other T cells, called cytotoxic T cells, produce toxic granules which cause the death of infected cells. Once they are made active, B cells and T cells produce memory cells. Throughout the lifetime of an animal, these cells will 'remember' each specific pathogen encountered, and are able to make a strong response if the pathogen is detected again. Memory cells live a long time in the body, and are how vaccinations work. Mammalian stem cells change or differentiate into several kinds of blood cell within the bone marrow. 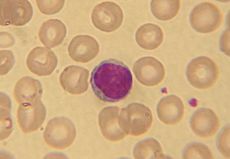 This process is called haematopoiesis (= blood growth). All lymphocytes come from a common basic lymphocyte cell before differentiating into their distinct lymphocyte types. B cells mature into B lymphocytes in the bone marrow, while T cells migrate to and mature in a distinct organ, called the thymus. After they mature, the lymphocytes enter the circulation and lymphoid organs (e.g. the spleen and lymph nodes) where they are able to sense invading pathogens and tumour cells. In the circulatory system they move from lymph node to lymph node. This contrasts with macrophages, which are rather stationary in the nodes. When white blood cells are counted, the lymphocyte count is the percentage of lymphocytes present. An increase in lymphocyte concentration is usually a sign of a viral infection (in some rare case, leukemias are found through an abnormally high lymphocyte count in an otherwise normal person). A low normal to low absolute lymphocyte count is found with infections after surgery or trauma. Human immunodeficiency virus (HIV) infects and destroys T cells. Without the key defence that these T cells provide, the body becomes prone to infections that otherwise would not affect healthy people. The extent of HIV progression is found by measuring the percentage of CD4+ T cells in the patient's blood. The effects of other virus or lymphocyte disorders can also often be estimated by counting the numbers of lymphocytes present in the blood. Lymphocyte Facts for Kids. Kiddle Encyclopedia.